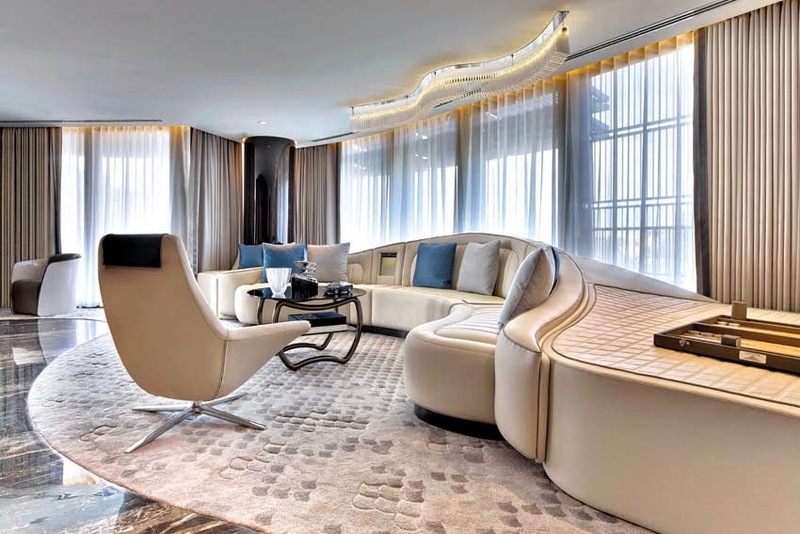 As the latest modern interpretation of the partnership between St. Regis and Bentley Motors, the Bentley Suite at The St. Regis Istanbul unites craftsmanship and luxury, with a curvaceous design inspired by the Bentley Continental GT. The suite lends itself to entertaining with an expansive balcony overlooking Maçka Park with breath-taking views of the Bosphorus and the city. The living room and bedroom, as well as the one and a half baths, dressing room and powder room feature bespoke details derived from signature Bentley design cues. "The new Bentley suite at The St. Regis Istanbul marks the next phase of the partnership between Bentley and St. Regis Hotels & Resorts. The emergence of Turkey as a modern luxury destination affords Bentley the opportunity to bring our signature style and contemporary design to a new and discerning audience of travellers who want to experience the soul and sophistication of a gateway city in an environment of exceptional materials and finishes," said Christophe Georges, Director, Product and Marketing. The entrance foyer benefits from mirrored ceilings, reflecting a marble floor inset with a Continental wheel inspired design. On entering the living area, walls of curved veneer evoke the Continental while highlighting the suite's corner location. Floor to ceiling windows maximise the panoramic experience, providing a unique entertaining space against the backdrop of some of Istanbul's most iconic sights. These same vistas can be enjoyed from an oversized terrace. The living room features a bespoke built-in sofa crafted from Bentley leather, which brings Bentley's unique motoring luxury indoors. The sofa, equipped with two champagne bottle coolers, features signature Bentley diamond upholstery with curved lines that echo the architecture of the suite. Overhanging the scene, a captivating light installation based on the Continental's jewelled headlights and the sinuous curves of the Nürburgring Racetrack completes the room. Handcrafted finishes and individual furnishings are prevalent throughout. His-and-hers jewellery boxes cosset guests' treasured items during their stay and sit alongside items from the Bentley home collection, notably the chaise in the bedroom. Bentley's iconic matrix grille also features in abstract form; captured in wool and silk in an exquisitely crafted rug. Custom flooring and carpeting line the separate bedroom, where an expansive work desk resides alongside a 40-inch pop-up television. 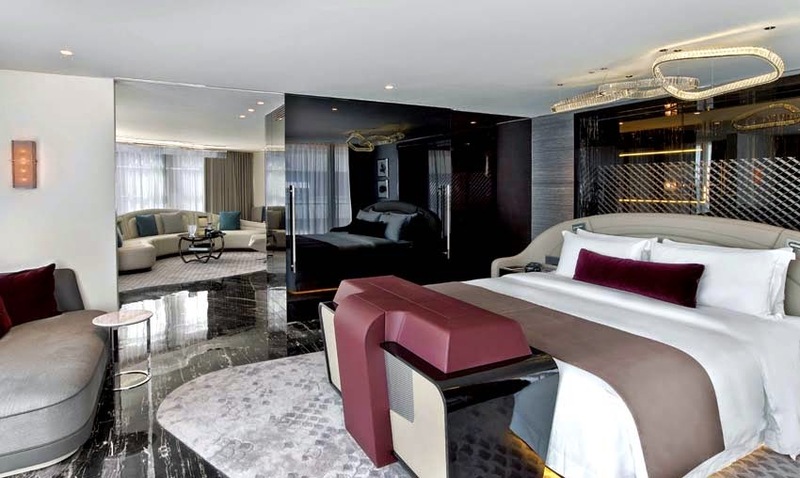 A bed base, tailor-made from burgundy hide and bright engine spin, houses an oversized signature St. Regis bed while an entry touch panel and portable iPad place room controls at guests' fingertips. A glass box within the bedroom, the master bathroom extends the bespoke experience, employing marble book-matched slabs to create a dramatic pattern that surrounds a dual-basin sink, glass-enclosed rainforest shower, and freestanding glass-enclosed bathtub. A 19-inch mirror television further elevates the restorative retreat, while an adjacent dressing room ensures complete privacy. Designed with travellers' needs in mind, it boasts shelving, storage, and a makeup vanity. The suite also features an additional full bathroom and powder room. Guests can enjoy an immersive musical experience courtesy of British hi-fi creator Naim Audio. In the living room, the high-performance SuperUniti all-in-one player is integrated into the room, producing a crystal-clear sound, and allowing guests to relax with their own music. In the bedroom, guests can access Naim's award-winning Mu-so wireless music system via Bluetooth. It features technology inspired by Naim's in-car audio system, available exclusively as a custom option for all Bentley models. 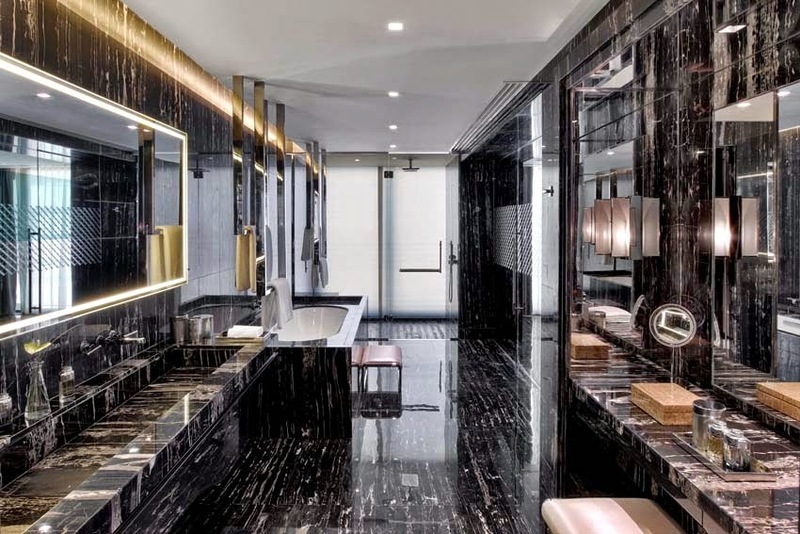 Marking the debut of the luxury brand in Turkey, The St. Regis Istanbul is designed by award-winning Turkish architect Emre Arolat, and is a modern interpretation of Istanbul's glamorous Art Deco era. The St. Regis Istanbul is home to the first international outpost of Wolfgang Puck's Spago restaurant, which stars as the hotels signature culinary experience. Located on the hotel’s rooftop, the restaurant offers stunning views of the vibrant city. The hotel also offers rejuvenating spa treatments at the Iridium Spa.